Wirehaired Fox Terriers have flat tapering skulls and wiry white coats. Wire Fox Terriers are compact dogs with v-shaped ears and thick muscular necks. This breed has powerful jaws. The Wire Fox Terrier originated in England. 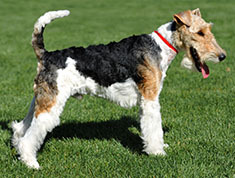 The Wire Fox Terrier's coat is predominantly white with black or brown splash marks. Wire Fox Terriers shed little to no hair and are good for people with allergies. As a non-show dog, the Wirehaired Fox Terrier's coat should be groomed only when needed. This energetic, fun loving dog is affectionate and playful. Wirehaired Fox Terriers are scrappy and impulsive and have been known to bite, so should be watched around children. Wire Fox Terriers are courageous and devoted and make excellent watchdogs, though they have been known to bark excessively. Wire Fox Terriers like to explore so should be kept in a safe enclosed area, and will sometimes even kill birds or small animals if given the chance. Wire Fox Terriers are prone to epilepsy, post nasal drip, lens luxation, distichiasis, cataracts, Legg-Perthes, shoulder dislocation and skin problems. Deafness may be a problem in predominantly white dogs. Wire Fox Terriers can get enough exercise running around inside by themselves. This breed loves to go for walks and be set free in safe enclosed spaces. Wirehaired Fox Terriers will chase smaller animals if given the chance. If you’ve ever seen the classic “Thin Man” movies, you might remember Asta, played by Skippy. Although in the book, Asta was a Schnauzer, in the movies, he was a Wire Fox Terrier. If you’re not familiar with The Thin Man, all you need as a reminder of what a Wire Fox looks like is to have seen Sky, the winner of the 2014 Westminster show. This makes the 14th time a Wire Fox has won it all at Westminster, more than any other breed. The Wire Fox stands as tall, measuring 15-1/2 inches tall at the shoulder, and weighs between 15 and 19 pounds. Although the Wire Fox bears a resemblance to the Smooth Fox Terrier, they are believed to have been developed separately. The Wire coated variety was developed in the British Isles in the 17th century, a descendant of the rough-coated black and tan terrier. As the name implies, the Wire Fox Terriers’ raison d’etre was to assist in fox hunts. Unlike hounds that chase the prey, the Wire Fox would spend most of the hunt in the hunter’s saddlebags until the quarry went underground. Like all terriers, the Wire Fox chases his quarry when they go underground, cornering foxes and other small game in their dens. The short, docked tail is used to pull the dog back out of the den when the hunter arrives because they will never give up and leave on their own. What is the breed standard for the Wire Fox Terrier? 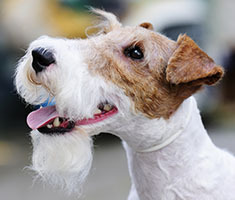 The American Kennel Club’s breed standard describes the Wire Fox Terrier as “alert, quick of movement, keen of expression, and on the tip-toe of expectation at the slightest provocation.” The keen expression is especially shown in the dark, small eyes which are said to be full of fire, life and intelligence. Physically, this terrier is a bit larger than some of his terrier compatriots. The Wire Fox stands as tall, measuring 15-1/2 inches tall at the shoulder, and weighs between 15 and 19 pounds. The dense, wiry fur is composed of closely packed, twisted hair resembling coconut matting. This course outercoat covers a soft, downy undercoat. The color of the coat isn’t a defining factor in the breed standard, although white should be the predominant color. The most typical coloring is white with a black saddle and brown markings on the face and ears. 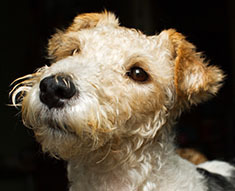 The distinguishing traits of the Wire Fox, as for most terriers, are energy and intelligence. These dogs crave companionship, and are not happy being left alone for long periods of time. Their unhappiness can spill over into terrible behaviors such as digging, barking, and general destruction of your home. If you must be away from your Wire Fox Terrier, be sure to leave behind plenty of toys to keep him both physically and mentally stimulated if you hope to return to a home that is still standing. Wire Fox Terriers crave companionship, and are not happy being left alone for long periods of time. 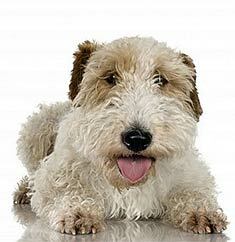 Wire Fox Terriers should be friendly and playful. They usually enjoy swimming and are terrific at catching vermin, should you have a need for that. That love of the chase can get them in trouble, though. You must make sure to have a secure fence to keep them from chasing bikes, cars, small children, and the family cat. Continual obedience training can help, but will never totally overcome the prey drive that keeps these animals in constant motion. Early socialization is required if the Wire Fox will be living with cats or other small household pets to reinforce the lesson that everyone is part of the family, not prey. They are intelligent enough that you’d think they would be trained fairly easily, but they are stubborn enough to require a firm and consistent trainer. Wire Fox Terriers are especially competent in agility and fly ball competitions, as well as in digging up the family garden. Like most smaller dogs, Wire Fox Terriers often forget they could get hurt when playing with big dogs, so some supervision is needed at the dog park or on play dates with larger animals. If they can go toe-to-toe with a snapping fox, they are really not going to have much problem facing down anyone, and they don’t realize they could get hurt by trying. After a hard day of play, your Wire Fox will be perfectly happy to warm your lap in the evening or snuggle under the covers overnight. As long as they are by your side, they are going to be happy. If you are keeping a Wire Fox Terrier as a pet or a hunter, you will probably deal with grooming needs by having the dog clipped every month or so. However, if you are showing your dog, you will need to hand strip the coat several times a year to preserve its colors and glossiness. Clipping results in curls, which are not acceptable in the show ring. Clipping also dulls the distinctive coloring of your dog. Hand stripping takes out the dead hair, leaving behind the proper texture for the show ring. Hand stripping involves pulling out the dead hair, as would happen naturally in the wild when terriers run through underbrush in search of their quarry. The Wire Fox does not naturally shed to get rid of excess hair, so the fur must be pulled out, either by brambles or by a groomer or family member. Weekly brushing and combing will keep the fur from becoming tangled. Is the Wire Fox Terrier a healthy breed? Like most Terriers, the Wire Fox generally lives 13 – 14 years. There are no breed-specific health problems, although as with any breed, individual dogs may suffer from any canine illness. Is the Wire Fox Terrier the right breed for my family? If you want a fun-loving companion with high energy and low shedding, this may be the breed for you. However, if you cannot spend a lot of time home with your dog or you are daunted by the prospect of trying to train a dynamo, you might look for other breeds to better fit your lifestyle. Find Fox Terrier (Wire) Puppies with our Free Breeder search!